A summertime tradition in Minnesota...going up north to the lake cabin. Rent your own Minnesota resort property, in the Brainerd Lakes Area, the BestView Cabin at Breezy Point. One of the original log cabins built in the 1930's at this historic MN resort. We maintain a Country Club Membership giving our guests access to all resort amenities. Walking distance to lake and beach access, indoor pool & game room, Marina II Restaurant & Dockside Lounge, and nightly entertainment. Breezy Point named Best Family Resort 5-years-in-a-row from MN Parent Magazine. Breezy Point is in the heart of the Brainerd Golf Trail with over 300 holes of golf all less than 45 minutes apart. Ranked 'One of the Top 50 Golf Destinations in the World' by Golf Digest. 40 minutes from Grand Casino Mille Lacs. Minutes from the 100-mile Paul Bunyan Biking Trail. Boating, fishing and water sports are a mainstay of the Brainerd Lakes Area lifestyle. 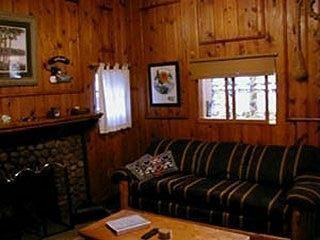 Unit Description: Knotty pine interior throughout. Field stone fireplace warms those cool northwoods nights. Kitchen features light knotty pine, exposed wood timbers and oak cabinetry. Full size bed with twin bunk overhead in bedroom, queen size sofa sleeper in living room. Completely furnished accommodations. Five room cabin with kitchen, living room, 1/2 bath & separate shower room, closet & bedroom (approx. 650 sq. ft.). Breathtaking sunrises over Pelican Lake from the wraparound deck of this lake view property. Annual flowers adorn deck planters and perennial garden. Picnic table on deck for outdoor dining. 6 foot fence frames the garden and provides privacy from neighboring cabin. Property is located in an active resort community setting. Not for those desiring tranquil isolation. Breezy Point is located on the west side of beautiful Pelican Lake in northern Minnesota. To our guests, Pelican Lake offers a great source of fun. Fish, swim, go boating or just enjoy the view. Picturesque views of Pelican Lake from the property. Cabin has a conditioned water supply and uses a PurTM water filter. No oven. Parking space for two mid-size vehicles next to property. Additional space in the lot at the head of Circle Dr. Basic cable TV stations with Charter Communications. 8000 BTU portable A/C unit, box and standing fans in addition to ceiling fans cool the property. Breezy Center features Game Room with video games, ping-pong and pool tables; indoor pool, whirlpool and sauna; pizza, ice cream, Caribou Coffee and DVD rentals. The resort's Registration Office has four internet access terminal and is a Wi-Fi hot spot. Good cell phone coverage in the area.